Whether you’re inquiring into nursing homes for your elderly parents, for yourself, or for another loved one, know you’re doing the right thing. Nursing homes can provide the elderly with around-the-clock care, which is necessary for many people who need constant supervision and can no longer live alone. 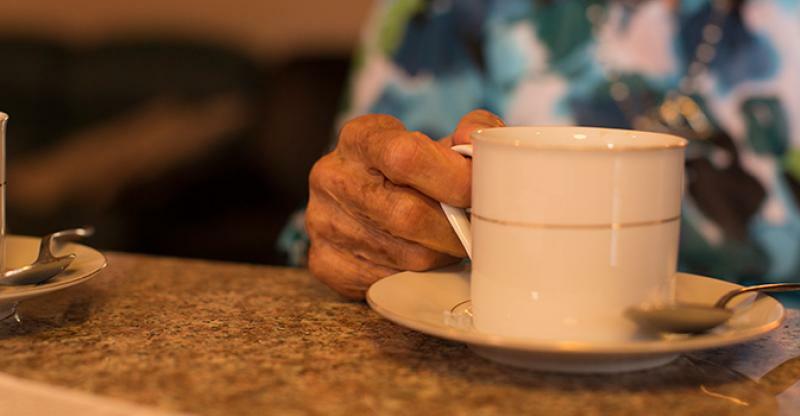 Seniors typically move into nursing homes permanently when they can no longer take care of themselves, but some are only their short term, while they recover from an illness or surgery. With that said, nursing homes are not cheap. It’s a top-of-the-line service with many variables affecting the price, but you get what you pay for. It’s a premium service to improve senior’s quality of life. It gives seniors the opportunity to socialize, get constant medical attention, and removes the need for housekeeping and other errands that may prove troublesome. Here we’ll look more into the price of nursing homes and what you can expect to pay based on your state. What you end up paying for nursing home care will depend on a variety of factors. Where you live, who you choose to go with, the type of care you wish to receive, as well as special needs all affect the final price you’ll pay. 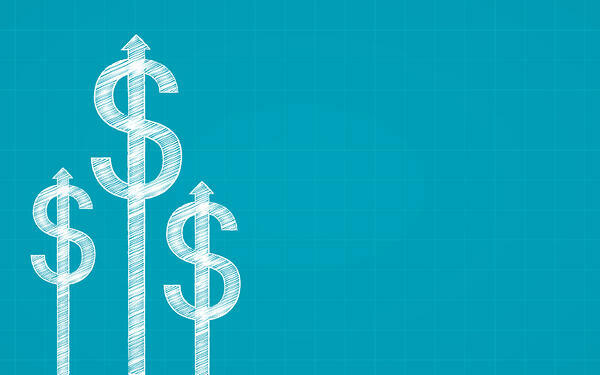 There may be extra costs thrown in for those requiring special care, such as dementia care, but below you’ll find the average cost of nursing home care in the United States. 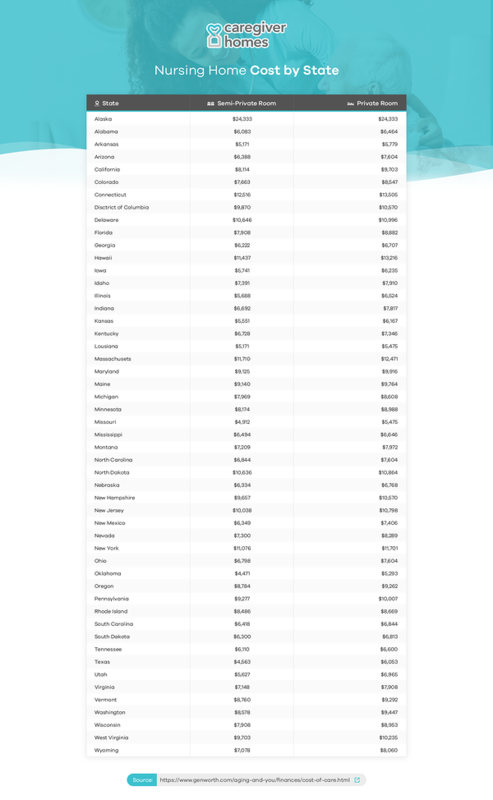 We’ve created this helpful infographic to provide a quick reference guide on monthly nursing home costs in every state based on data from Genworth’s 2017 Cost of Care Survey. The graphic includes both the average cost of a private room and the average cost of a semi-private room. Note that costs vary significantly from state to state. As you can see, nursing homes can be quite expensive. If you can afford it, they undoubtedly provide unparalleled comfort and service, with the main draws being 24/7 support and the ability socialize with others. If you’re looking into in-home care, expect to pay substantially less. There are three types of in-home care; non-medical, home health care, and skilled care. Non-medical home care assists seniors with day-to-day living, doing things like laundry, assisting with personal hygiene, cooking, cleaning, and transportation. In 2017, the national average for a non-medical in-home aide was $21 an hour. Home health care is someone who provides medical aide at home, assisting with things like checking pulses, temperature, and helping out with any medical equipment like ventilators. The average hourly rate for a home health care aide in 2017 was also $21 an hour. Skilled nursing care involves providers who are trained nurses or therapists and can assist with things like injury care, wound care, and medications. This can be quite expensive, costing upwards of $220 a day. You can pay for nursing home care privately or go through health insurance, life insurance, long-term insurance, or other methods of off-setting the cost, such as annuities. Programs like Medicare, Medicaid, and veterans programs can also sometimes contribute. Medicare typically won’t pay for nursing home care. There are certain situations where it can cover short-term stays in nursing homes. If the patient has a three-day qualifying inpatient hospital stay, requires the assistance of a skilled care worker, and has been admitted to a Medicare-certified facility, Medicare will contribute for up to 100 days. Your local State Health Insurance Assistance Program (SHIP) can help you understand what long-term care options are available and what services are covered by Medicare. Medicaid does cover services like long-term care for low-income patients. It often pays for the entire cost but there may be co-payments in some circumstances. Veterans with service-related injuries are entitled to long-term care services being covered by the Department of Veterans Affairs. They will usually cover the full price, but if your income is substantial, co-payments may be required. Nursing home care is expensive, and the costs continue to rise year after year. Because the cost of nursing home care is out of reach for many older adults, more seniors are opting to age in place with the help of family caregivers.